Find out how you could holiday here Take your pick from over 30 stunning locations including Coreggia in Italy WHAT'S SO SPECIAL ABOUT HPB? Many of us dream of a holiday home in a beautiful location, somewhere to escape to for really relaxing breaks as often as we choose. The Holiday Property Bond is a practical and affordable alternative. It offers you exclusive access to a portfolio of over 1,400 top-quality villas, cottages and apartments in 32 locations across the UK and Europe. You can use them for the whole of your life - without the problems and worries of ownership such as organising repairs, cleaning and gardening. HPB's portfolio of properties offers you some of the most desirable holiday locations in the UK and Europe and some of the loveliest properties, from restored stately homes to modern villas. Our investors ('Bondholders') frequently tell us that HPB has transformed the quality of their family holidays. Our elegant and comfortable holiday homes, fantastic on-site facilities, helpful staff and beautiful locations all combine to make HPB the last word in relaxation – as you will hear from some of our Bondholders in their own words. HPB began as a new idea, but it rapidly became a proven success. As the number of investors (Bondholders) has grown, so has the number of holiday properties we have been able to buy or build. Although you do not own the properties, the fund in which your money, after charges, is invested had net fund assets (properties and securities) of over £280 million as at 31st December 2017. The fund has no borrowings, and never has had. 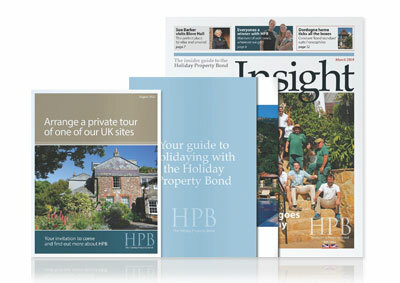 Please read "Holiday better with HPB" and then fill in the form and we will be delighted to send you our brochure and information pack, including our DVD introduced by Bondholder Sue Barker, a full list of forthcoming Open Days and Exhibitions and our beautifully illustrated full property portfolio. See the beautiful holiday homes and magnificent locations where you can spend your holidays as a Bondholder.